Today we went to the lovely Penlee House Gallery in Penzance, where the current exhibition, just opened, is A Cornish Childhood: Paintings of Children 1880-1940. The exhibition blurb talks about the lives of children in the county having been recorded by some prominent artists, looking at children’s pastimes from playing on the beach to going to Sunday School. Paintings of children can be a little problematic because of the tendency towards idealization and nostalgia, and it’s true that there is plenty here to provoke nostalgia, but actually the sentimentality is kept to a minimum and there are some very interesting paintings here – both as works of art, and as a collection which documents children’s historical lives in Cornwall. Laura Knight’s paintings are, of course, well-represented here, with paintings such as In the Sun, Newlyn (1910) (left) which has a wonderful holiday feel to it, and which contrasts interestingly with Dorothea Sharp’s more nostalgic and, dare I say it, slightly twee pictures. Knight’s images of children seem nicely un-posed and relaxed, as though she caught them unawares. Other pictures, such as Jessie Ada Titcomb’s When All the World Was Young, c 1895, are carefully constructed to provide shape to the canvas, with young girls in white dancing in a flower meadow in a rather aestheticised construction that, bizarrely, reminded me of The Dance by Matisse. 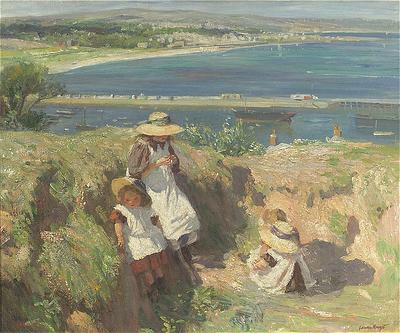 Some pictures are a little Famous Five, particularly Frank Gascoigne Heath’s paintings of his family at Lamorna, though the children remain real children, not idealized or seeming overly posed or synthesized. There are many paintings by Harold Harvey in the exhibition, including Wading Ashore (1909), which I like because the child wading looks sunburned and cross at having to carry her sibling, as if making no concession to the painter. Harvey’s remarkable sunlit scene in Apples (1912), the girl’s face screwed up against the bright light, is reminiscent of Ford Madox Brown’s The Pretty Baa Lambs. One of the most striking images of the exhibition, I thought, was Harvey’s The Gate (1919), which shows an almost naive landscape and children, a boy sitting on a gate playing a pipe to two girls. It’s so evocative one can almost hear the music drifting across the fields behind them in the sunlight – and all the more poignant for its date, just after the end of the Great War, when such innocence was to be treasured. There are, of course, pictures here that are less about innocence and more about the lives of Cornish children – collecting firewood, or carrying water; as apprentices, or leading horses. The sadder side of childhood seems apparent in Walter Langley’s paintings, which seem to specialize in wistful looking children, particularly in paintings such as A Fisherman’s Son (1884), in which a small boy sadly contemplates his toy boat, leading the viewer to suspect that he has lost his father to the sea, a theme also present in Memories (1885). This is a very full exhibition, with a wide range of themes relating to childhood, and one which will have a wide appeal, not just to the summer season of holiday-makers, but to those with all kinds of interests in art, too.